I had been thinking about getting a Philips Hue starter kit for a few years now but the high price always made me put the idea to bed. This year though I though I had been thinking about getting a Philips Hue starter kit for a few years now but the high price always made me put the idea to bed. This year though I thought I'd treat myself as with the new generation 3 bulbs included which give richer more accurate colour and the new v2 bridge box that supports iOS Homekit, Siri, Apple TV & much more it felt more worth it than ever! I have to say I was not left disappointed. Hue really is amazing, the light these bulbs put off is incredibly atmospheric which is to say they have a huge range of bright and accurate colour capabilities. If you've ever used cheap or early LED's in the past you're probably used to them having limited colours or being able to accurately portray the colour you've selected. That just isn't the case with this Philips Hue kit, the generation 3 bulbs are so accurate to what you select. As I mentioned above, the Hue system put me off in the past due to the price but it's easy to see why they're expensive, the quality is there, these are by far the best LED's I've ever seen in person. SETUP: The Hue system is really easy to setup, put the bulbs in your sockets, turn the light switches on, plug the bridge in to an electrical outlet and into your router/switch with the provided ethernet cord and then install the Philips Hue application on your phone. Once you open the app it'll ask you to scan a bar code from the starter kit box inside, once you do that using the camera on your phone it'll add the bridge box and your three starter bulbs and then you can specify what rooms the bulbs are in and give them descriptive names (ceiling light, desk lamp, bedroom light etc) and you're done. USAGE: You can then control the lights independently by setting the colours manually from the app or by providing an image to create a lighting "scene" where different lights take on different colour aspects of the image you provide. 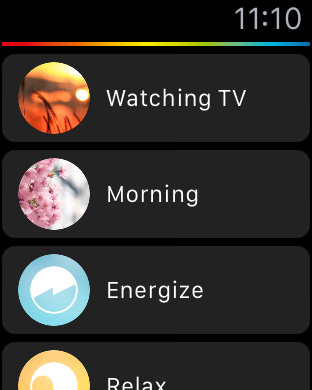 You can also specify scenes or specific colours using your voice via Siri on your iPhone, Watch or Apple TV. 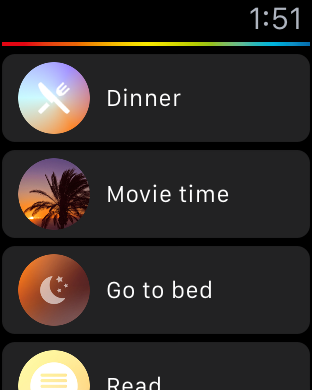 Personally I'm using Apple TV 4K Siri Remote and I can control my Hue lights using Siri, it works perfectly on both the iPhone and Apple Watch. I can say things like "Set bedroom ceiling light to Blue" or "Set desk light to Cyan" and Siri will do it instantly, it really has no delay if Siri was able to transcribe what you said accurately. This functionality with Siri does not extend to macOS so you cannot use Siri on macOS Sierra to control your lights, Siri integration only works on devices which have Homekit right now which as of this review includes only iOS devices like the iPhone and by extension the Apple Watch.